“Loyalty” is a term that has been bandied about the marketing world for the past decade and is the operating principle for customer retention. Or should be. Virtually all marketers acknowledge that retention and loyalty are desirable qualities, though definitions are highly varied: the most common of which is using “retention” as a surrogate for satisfaction, a customer’s past behavior that tells a brand little about the future, or how likely customers are going to stand by you. 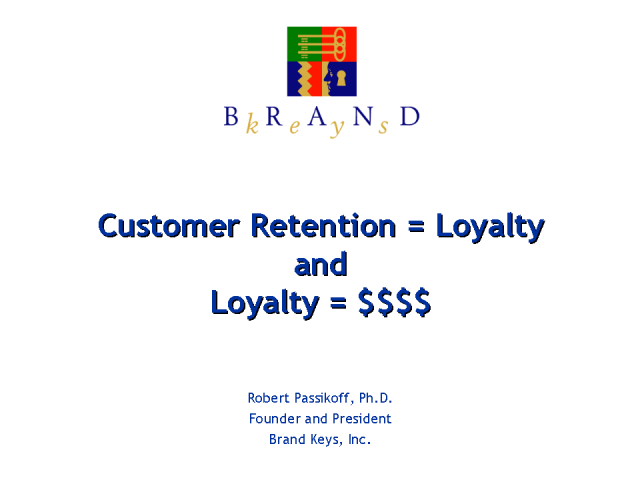 Loyalty and customer retention was always desirable but it was not as critical in the past as it is today. The convergence of marketing, production, and satisfaction initiatives has produced a large set of companies that do it “right,” and who “satisfy” their customers. But today, “right” does not translate into “retention,” and today brands need to concentrate on that more than ever. •	Wireless handset and PDA brands find that consumers are 14% more likely to buy the brand again versus a competitor. •	For over-the-counter drug brands, consumers are 6% more likely to offer a higher opinion regarding the brand. •	Web-based service brands have found that consumers are 15% more likely to use them versus similar offerings. Customer retention is critical and loyalty metrics are a wonderfully precise model for predicting how to best retain current customers and boost profits. Not only are there marketing efficiencies and economies available to brands that engender high retention levels, but real loyalty is a leading-indicator of positive consumer attitudes and, more importantly, behavior, and, ultimately real, bottom-line profitability. This presentation will show how to add predictive loyalty metrics to your marketing toolbox and virtually guarantee customer retention. Robert Passikoff, Ph.D., Founder and President, Brand Keys, Inc. Presented by: Robert Passikoff, Ph.D., Founder and President, Brand Keys, Inc.